It’s all in the name, and I’m counting on this allegedly longer-lasting make. Let’s just say that in 600 miles of cycling so far in 2013, this has not been my year. First came a broken shifter cable, annoying yet simple and inexpensive enough to fix. 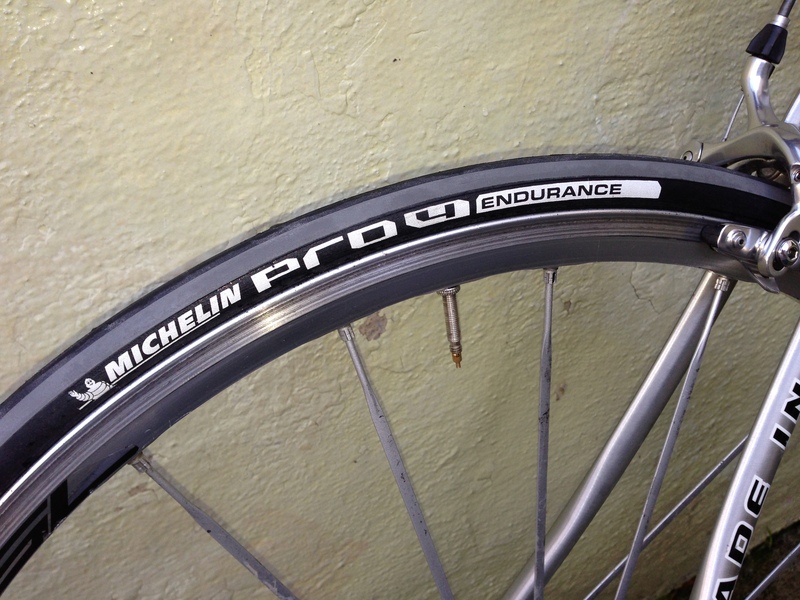 Then a week later came not one– but two!– sidewall punctures on a brand-new set of tires, from which these aptly named replacements came about. Apparently two “occasions” were insufficient vexation for a one-month riding period, because this past week produced a slip and a recovery, ending in– crack! The result: A broken carbon seat post. Now I’m back in the saddle once again. This series of rare setbacks to “endure” had me momentarily down, but certainly far from out. With 45 miles today, it appears I’m off to a solid restart. We’ll just have to wait and see if these tires keep pace with my psyche. After all, in both name and practice, it’s about: Endurance.